No other idea explains even two of these. Image credit: NASA / CXC / ESO WFI / Magellan composite. Any recent article about the remaining mysteries of the Universe will include dark matter close to the very top of the list of unsolved problems. What is it? Where is it? And if it’s there, how do we measure it? These are important questions still at the forefront of research in Cosmology. But this elusive substance that affects the motion of our galaxy and is the reason that galaxies exist with the properties they have, has only been detected indirectly, and has yet to be measured via direct detection. Earlier this year, the most sensitive dark matter experiment to date, LUX, released its results showing no direct evidence for dark matter and failing to confirm potential detections by two groups of experiments, DAMA/Libra and CoGeNT and Super-CDMS. Despite this, fellow scientists are pushing forward, determined to measure direct evidence of dark matter. The U.S. Department Of Energy and National Science Foundation are on board with this plan, as they recently announced a new round of funding for 3 upcoming dark matter experiments: LZ (the successor to LUX), SuperCDMS-SNOLAB, and ADMX-Gen2. So if we haven’t measured dark matter directly yet, what is keeping researchers on the scent and funding agencies interested? 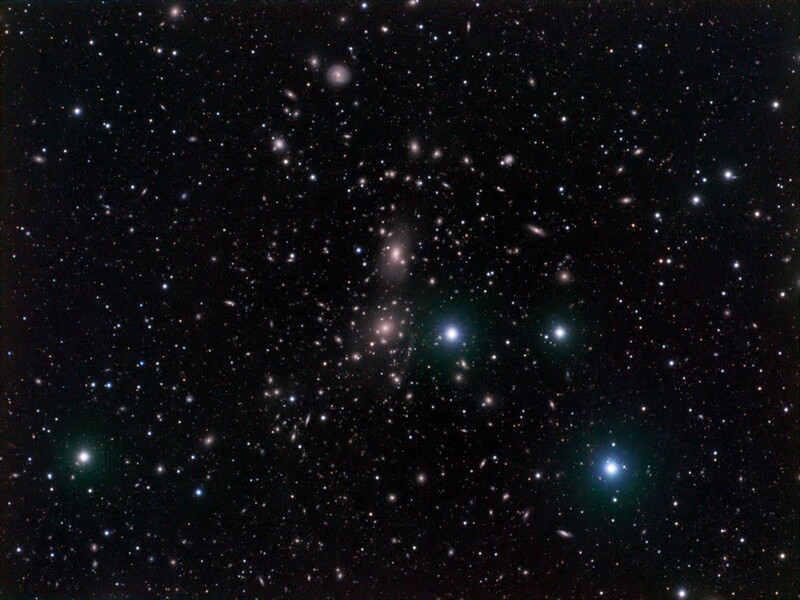 Image credit: Paul Tankersley’s astrophotography, of the Coma Cluster of galaxies 321 million light-years away, via http://ptank.blogspot.com/2010/05/abell-1656.html. Throughout space, astrophysical objects of all sizes swirl and orbit: planets revolve around our sun, stars orbit around our galactic center, and individual galaxies in groups whiz around themselves. To keep these objects tightly bound together, the gravitational pull felt by an object must be strong enough to balance the energy it has due to its motion. A fast-moving object with more kinetic energy is harder to keep gravitationally bound. 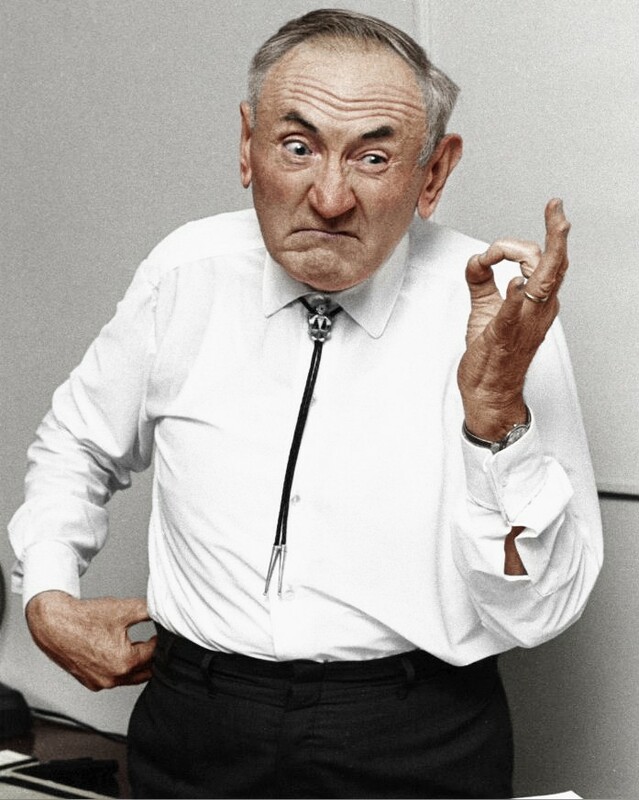 In 1933, Fritz Zwicky (below) was studying the nearest very large cluster of galaxies to us in space: the Coma cluster (above). Image credit: source unknown; believed to be public domain. See http://www.aip.org/history/cosmology/credits.htm. He used the virial theorem, an equation which relates the average kinetic energy of a system to its total potential energy, to infer the gravitational mass of the cluster. He then compared that to the mass inferred from the bright, luminous matter (stars and gas) in the galaxies. You’d expect those two numbers — gravitational mass and mass due to luminous matter — to match, wouldn’t you? But instead, he found that the mass from the luminous matter was not enough to keep the cluster bound, and was several times smaller than the inferred gravitational mass. Assuming that the luminous matter constituted all of the mass in each galaxy, they should have been flying apart! He thus coined the term “dark matter” for the material that must therefore be present, quietly holding the galaxy cluster tightly together. Images credit: Van Albada et al. (L), A. Carati, via arXiv:1111.5793 (R). Observed velocities versus distance from the center of galaxy NGC 3198. The theoretical prediction before observations followed the trend labeled “disk”, but observations (black squares) showed constant, rather than decreasing velocity. Adding a contribution from a dark matter halo (center line) makes the theory match predictions. Similar evidence was observed within galaxies themselves. From standard Newtonian dynamics, we expect the velocity of stars to fall as you move from the near the center of mass of a galaxy to its outer edges. But when studying the Andromeda galaxy in the 1960s, Vera Rubin and Kent Ford found something very different: the velocity of stars remained approximately constant, regardless of how far they were from the galactic center. This and many future observations of the velocities of stars in spiral galaxies hinted that the mass of the galaxy must not be entirely defined by the objects we could see with our telescopes, which Rubin and Ford presented at an American Astronomical Society meeting in 1975. If instead a large fraction of the galaxy’s mass resided in a diffuse dark matter ‘halo’ that extended well beyond the edges of the luminous matter, the observed galactic rotation curves could be explained. Image credit: CMB pattern for a universe with normal matter only compared do our own, which includes dark matter and dark energy. Generated by Amanda Yoho on the Planck CMB simulator at http://strudel.org.uk/planck/#. The Cosmic Microwave Background (CMB) is the earliest photograph of our Universe. The patterns that we see in observations of the CMB were set up by competition between two forces acting on matter; the force of gravity causing matter to fall inward and an outward pressure exerted by photons (or particles of light). This competition caused the photons and matter to oscillate into-and-out-of dense regions. But if the Universe consisted partially of dark matter in addition to normal matter, that pattern would be affected dramatically. The existence of dark matter leaves a characteristic imprint on CMB observations, as it clumps into dense regions and contributes to the gravitational collapse of matter, but is unaffected by the pressure from photons. We can predict these oscillations in the CMB with and without dark matter, which we often present in the form of a power spectrum. The power spectrum of the CMB shows us the strength of oscillations at different sizes of the photons and matter. The Wilkinson Microwave Anisotropy Probe (WMAP) was the first instrument to measure the CMB power spectrum through the first peak of oscillations, and showed that the existence of dark matter is favored. Image composite credit: X-ray: NASA / CXC / CfA / M.Markevitch et al. ; Optical: NASA / STScI; Magellan / U.Arizona / D.Clowe et al. ; Lensing Map: NASA / STScI; ESO WFI; Magellan / U.Arizona / D.Clowe et al. In 2006, astronomers working on the Hubble Space Telescope and the Chandra X-ray Observatory released exciting information about an object known as the bullet cluster. This cluster is actually two galaxy clusters which have recently undergone a high-speed collision, forcing the contents of each cluster to merge together. Observations from the two telescopes allowed us to measure the location of the cluster mass after the collision using two methods: optical observations of X-ray emission and gravitational lensing. One way we can tell two clusters have just collided is through X-ray astronomy. An extremely hot gas of particles pervades the space between each galaxy in a cluster, which accounts for for about 90% of the mass from ordinary matter (rather than stars). When two galaxy clusters collide, the gas particles become even hotter from crashing into each other, causing an increase in brightness of the X-ray emission. From this we can tell how energetic the gas is and where it is located. Gravitational lensing occurs because matter isn’t the only thing that feels the effects of gravity: light does as well. This means that a massive object can act as a lens; a background source that emits light in all directions will have some of that light focused if it passes by a massive object. By measuring these focused images, we can infer the location and mass of the lens between us and the source. a.) Dark matter interacts with its surroundings significantly less frequently than ordinary matter. b.) During the cluster collision, the dark matter of one cluster would have slipped through all of the objects in the other cluster with relative ease. c.) The luminous matter, on the other hand, would have bounced off of other particles around it, causing it to slow and separate from the dark matter. The net result? High-velocity collisions between galaxy clusters should have the majority of their mass — in the form of dark matter — pass through one another unimpeded, while the normal matter collides, slows down, and heats up, emitting X-rays. Image credit: “Sloan Digital Sky Survey 1.25 Declination Slice 2013 Data” by M. Blanton and the Sloan Digital Sky Survey. When telescopes like the Sloan Digital Sky Survey map the locations the galaxies in the Universe, with the biggest features being referred to as large-scale structure, it sees a set of patterns that couldn’t happen with only the gravity due to ordinary matter at work. We know that before the CMB, ordinary matter wasn’t able to efficiently clump into dense objects due to the oscillations from the competing forces of gravity and pressure from radiation. The structure we observe is much more advanced in its evolution given the amount of time available for objects to gravitationally collapse after the time of the CMB. Instead, dark matter provides a reasonable explanation. Because dark matter didn’t undergo the same oscillations with matter and light, it was free to collapse on its own to form dense regions that helped structure formation get a head start, and allowed the distribution of galaxies and clusters to be what we observe today. These five independent pieces of evidence, when taken all together, provide a compelling reason that dark matter must exist. Reading through each explanation again, there is a common theme: gravity. Each piece of the puzzle relies on the way dark matter affects things around it via the gravitational force. 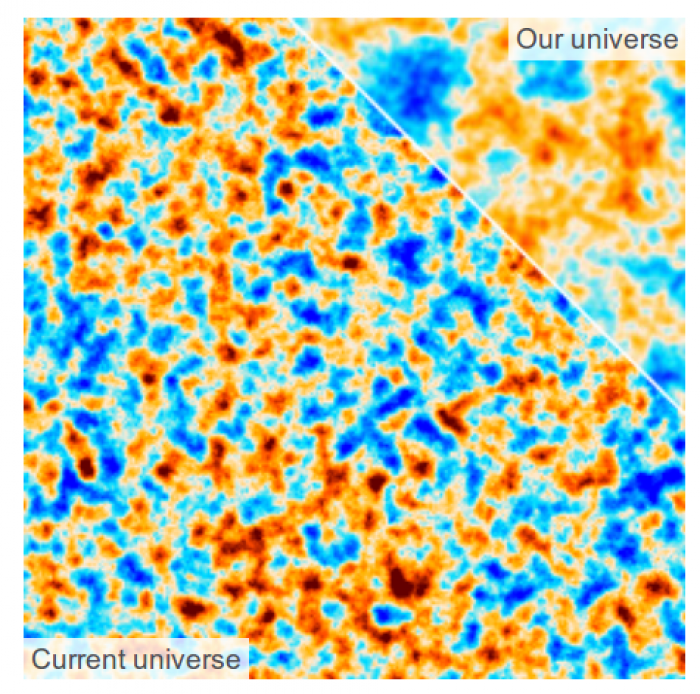 If I had to place bets, my money would fully be on the “dark matter” square. At conferences and seminars, astronomers, astrophysicists, and cosmologists speak about dark matter as though it’s a certainty (and most think it is). 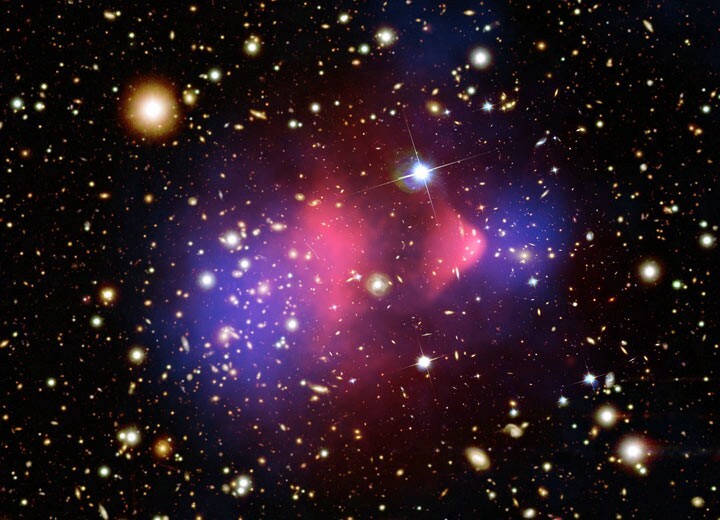 So why do I say “five reasons we think dark matter exists”? Since we haven’t measured it directly yet, and the evidence for dark matter’s existence centers on its gravitational interactions, a responsible scientific community would ask “what if we just don’t understand gravity as well as we think we do?” Some research groups have been tackling that question, investigating theories like MOND (MOdified Newtonian Dynamics), which are often grouped together under the umbrella “modified gravity.” So far, these theories have had successes in describing one of these peculiarities: galactic rotation curves, but have not yet provided an explanation for the complete set of observations like dark matter does. Modifying the theory of gravity is no easy game. We have fantastically precise measurements of gravity’s influence on objects throughout our solar system which fit precisely within the current understanding of gravity from General Relativity (a fact that underpins the precision of modern GPS). If you want to change the theory of gravity, you have to preserve its behavior as we’ve already measured it in the solar system. Further, the idea of modified gravity extends beyond trying to explain away dark matter. Modified gravity is an incredibly active field of research, with many ideas trying to explain the even more elusive phenomenon of dark energy. Often, these theories still require dark matter of some sort to exist. Images credit: NASA / WMAP science team, Gary Steigman (L), of Big Bang Nucleosynthesis and the baryon-to-photon ratio; Michael Murphy, Swinburne U.; HUDF: NASA, ESA, S. Beckwith (STScI) et al. 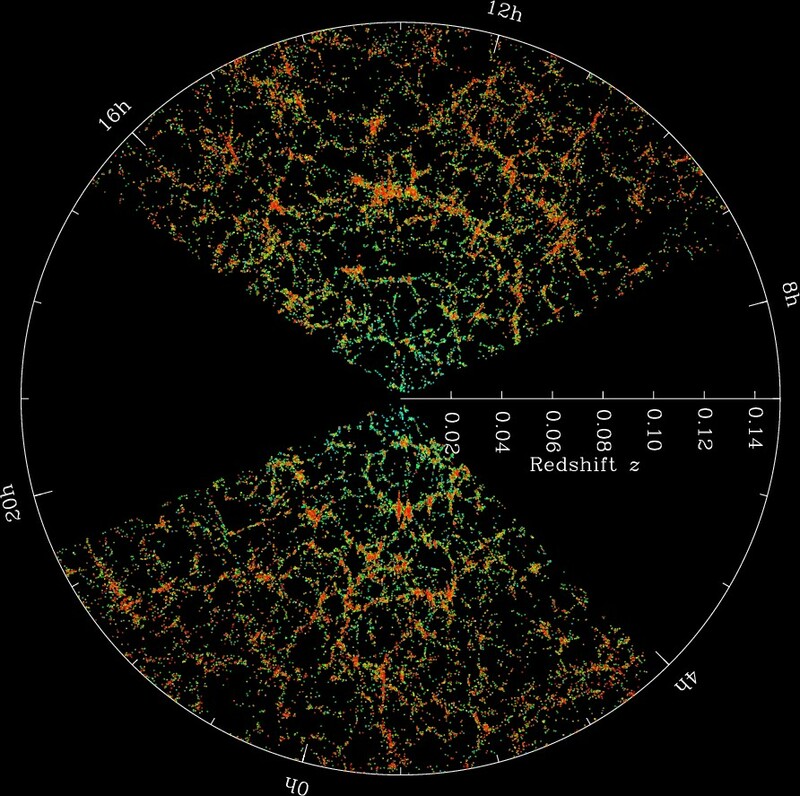 (R), of the Lyman-alpha forest from intervening intergalactic clumps of non-luminous matter. These five reasons don’t constitute the total observational evidence we have for dark matter. Big Bang Nucleosynthesis (BBN), which explains the way light elements such as Helium were formed fractions of a second after the Big Bang, tells us abundance of baryonic matter doesn’t account for the total matter content of the Universe inferred from other observations, and that dark matter can’t be just be things like protons and neutrons. Observations of molecular clouds — neutral hydrogen gas — absorbing light from background galaxies and quasars, known as the Lyman-alpha forest, gives us information about the location of dark matter clumps as well as how much energy dark matter particles are allowed to have. In almost every place we look, the Universe seems to be hinting that dark matter exists. The indirect evidence, from the early Universe to the present day, and from galactic scales up to the largest ones observable in the Universe, all point to the same conclusion. Direct detection is the next logical step. But that may be the biggest challenge of all: we still have to find it. This article was written by Amanda Yoho, a graduate student in theoretical and computational cosmology at Case Western Reserve University. You can reach her on Twitter at @mandaYoho. Have comments? Leave them at the Starts With A Bang forum on Scienceblogs!